his support for and leadership of several national and international efforts to link theory and practice in Austria, and across Western, Central and Eastern Europe. Günter Blöschl’s early work laid the foundations of learning from patterns. In a series of papers he unraveled landscape controls on snowmelt from snow patterns and developed quantitative measures to connect point measurements and remote sensing images. The downscaling method he had proposed has since been adopted as the standard approach in snow hydrology. Recognizing the importance of scale in spatial processes, his next step towards linking patterns and processes was to develop a general framework for dealing with issues of heterogeneity, organization and scale. His 1995 review paper in Hydrological Processes introduced the idea of the scale triplet in respect of natural variability (process scale), its relationship to observation and model scales, and approaches to connect them. This paper on scale issues has become a classic in the field and its impact has transcended hydrology: a Google Scholar search showed 800 citations across 40 disciplines with the top 100 citations coming from 30 different disciplines. With scale and patterns in mind, Günter realized that catchment hydrology also needed to advance spatial measurement methods. In 1995, together with Rodger Grayson, he turned these concepts into a radically new method of data acquisition. They equipped an all-terrain vehicle with fast automatic soil moisture probing and location instrumentation, allowing them to measure soil moisture at 2000 locations in less than a day - a target far beyond the imagination only a few years earlier. They conducted their first field campaign in Tarrawarra, Australia, with an overwhelming impact. The method was soon replicated in experiments around the world. The soil moisture patterns so collected provided fundamentally new insights into how water moves in the landscape, e.g., they found that in humid climates, there is a seasonal switch been vertical water movement in summer and horizontal water movement in winter, and that the switch is controlled by the soil moisture state. This body of work alone put them on the map, as did a highly celebrated book (Grayson and Blöschl, Cambridge University Press, 2000). Its impact was greatest in remote sensing since it enabled bridging the scale gap between field measurements and satellite data. A natural extension of his patterns work was to change the focus to regional scales, where such detailed data may not be available, and yet patterns can still tell us much about processes. Starting in 2000, and together with three generations of graduate students, Günter Blöschl has pioneered a completely new branch of regional process hydrology. Instead of field data he used regional hydrologic and climatic data, as well as remote sensing data on snow and soil moisture. The approach to learning from patterns was similar to his previous contributions, but with a new framework for interpretation. While, in the past, regional hydrological analysis had been purely statistical, he introduced process reasoning into regional hydrology by combining disparate hydrologic patterns with flood data in a way that highlighted regional scale processes. He exploited flood properties such as spatial coherence, seasonal occurrence and antecedent conditions to elucidate flood process types. For the first time in regional hydrologic analysis, he took advantage of the organization of the landscape into a tree-type stream network, through a new method termed top-kriging, to account for the scaling behavior of catchments. He disentangled the effects of storm duration, land use and soil moisture at the regional scale. This provided fundamentally new insights into why flood probabilities differed between catchments and how floods scaled with catchment area. He found that snowmelt floods scaled more linearly with catchment area than flash floods due to the different climate forcing. This work on patterns and the underlying process controls has led Günter Blöschl to a new thrust on “predictions under change”, connecting to a growing interest in hydro-climatology and hydro-meteorology. He has become an undisputed world leader in regional flood research. This leadership was recognized in 2011 through the award of the distinguished Advanced Grant from the European Research Council ($3M), for a large project focused on floods under change. Professor Blöschl’s work on patterns and processes has also contributed to the development of a unique, multi-year inter-disciplinary PhD program on water at Vienna Technical University that focuses on connecting biogeochemical and ecological processes impacting on water quality. The Vienna Doctoral Program, which commenced in 2009, has already grown to include 30 PhD students drawn from around the world, and will graduate 80 PhD students over its 12-year life span. Professor Blöschl has also worked assiduously to advance the practice of hydrology through improving the scientific basis of water management, in particular in the context of flood-risk management. Three groups of his projects illustrate this new approach and the impact it has had on hydrological practice: Dr Blöschl developed a new flood mapping method for implementing the European Flood directive. Through a number of projects he implemented the method in Germany and Austria to produce flood -risk maps that have since become the standard for flood risk management decisions. He designed the flood warning system for the Danube River and tributaries based on his process based approach, along with an ensemble prediction method to advise flood managers on the reliability of the forecasts in real time. The system is currently operational after being adopted by a number of public agencies and the water industry. Finally, Günter Blöschl has masterminded new guidelines for design flood estimation for large dams in Germany. The new guidelines are based on his process based flood analysis approach and provide a clear framework to practitioners on how to estimate design floods in a changing world. The guidelines have recently been adopted as the national standard and are currently being adopted by other European Countries. Günter Blöschl is a truly international scholar. In the past ten years alone he has delivered almost 100 invited keynote lectures in more than 20 countries. His research network extends all over the world. He has served on the editorial boards of 10 of the most influential hydrology journals. He has been Austria’s representative and an active participant in the International Hydrology Programme (IHP) at UNESCO. Notably, he has been the Chair of the UNESCO Working group of climate and land use impacts on flooding as a function of scale, and led an international effort towards understanding flood processes around the world. This activity involved the organization of an international workshop in Bratislava and culminated in a much-cited paper in Hydrological Processes. He has been honored through appointments to numerous advisory committees for institutions including UNESCO, GeoForschungsZentrum Potsdam, the German Federal Institute of Hydrology, the German Academy of Science and Engineering, and the Swiss NFP Program. He has been elected Fellow of the American Geophysical Union and as Member of the German Academy of Science and Engineering. In 2011 he was elected President of the European Geosciences Union, the first (and so far only) hydrologist to receive this recognition. Previously, he had served four years as President of the Hydrology Section of the EGU. Professor Günter Blöschl has been very actively involved in the work of IAHS. 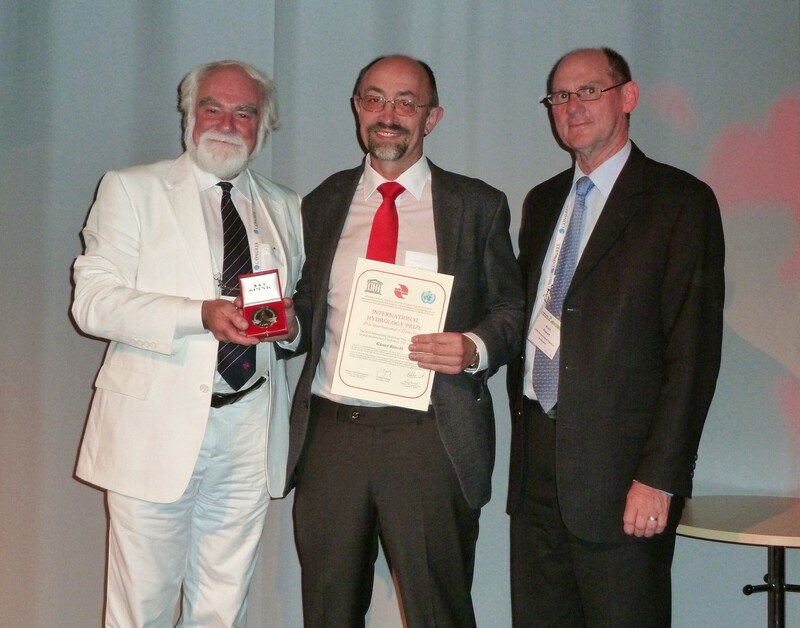 He has been the IAHS national representative of Austria for more than a decade. He has organized more than a dozen symposia and workshops at IAHS conferences and has edited numerous IAHS red books. Importantly, he has provided global leadership in his capacity as Vice President and currently President of the International Commission on Water Resources Systems of IAHS. He also served for 2 years as Chair of the IAHS Predictions in Ungauged Basins (PUB) initiative. During his term he commenced and led a global benchmarking exercise that culminated in the publication of the IAHS PUB Synthesis book “Runoff Predictions in Ungauged Basins: A Synthesis across Processes, Places and Scales” published by Cambridge University Press. The PUB Synthesis book is unique and pioneering in many respects. It is the first-ever global synthesis of the collective experience of thousands of modeling/prediction studies in over 20,000 catchments around the world. It presents, for the first time, a comparative assessment of the performance of a diverse range of prediction methods, organized along the axes of processes, places and scales. The book had over 130 contributors drawn from around the world, and it is through Günter’s painstaking and uncompromising efforts that these contributors were able to speak in one voice, and the book came together as a coherent and comprehensive treatise on the subject. In the process of synthesizing the outcomes of the comparative assessment, the book also heralded the emergence of a new paradigm for hydrologic science and predictions, involving a synthesis of Newtonian and Darwinian perspectives. In time, being the lead editor of this monumental book will be deemed one of the greatest contributions Professor Blöschl will have made to the IAHS and to hydrologic sciences. 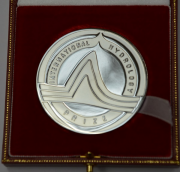 In summary, Professor Günter Blöschl is a very worthy recipient of the International Hydrology Prize and I have the great honour in being able to present it to him. Dear friends, ladies and gentlemen, it is a tremendous honour for me to receive this prestigious award from IAHS, WMO and UNESCO, today in front of this esteemed audience. Gordon, I am truly humbled by the generosity of your award citation. Thank you very much. In your review of my achievements, amongst other things, you mentioned my contribution to the practice of hydrology through improving the scientific basis of water management. I am grateful that you picked up on this theme, since it does strike a chord with me. Indeed, benefiting from the synergies of fundamental and applied research is something very close to my heart. Clearly, combining theory and practice represents a two way feedback. Advancing scientific hydrology can contribute tremendously to better decision making in practical applications. This is not to claim that policy decisions in water management rely exclusively on hydrological predictions. Of course, there is a host of socio-economic or political aspects that need to be considered by decision makers, but improved hydrologic process understanding and better prediction methods can make a big difference in water resources management and planning in real world projects. Conversely, being involved in practical work is similarly important to keep you on track, not to wander off to an ivory tower of hypothetical methods developed for their own sake. Practice sharpens the focus on what is important and helps guide the research agenda along topics of societal relevance. Just like hydrology is at its best when field work, modelling and theory come together in the same person, it is the combination of theory and practice that makes hydrology thrive and prosper. Of course, straddling these two worlds of science and engineering is a continuous challenge but one I have found highly satisfying over the years. Water has always fascinated me ever since I was a child. One of my favourite pastimes in the early years was to sit and watch the flow of water and, where there was opportunity, build little dams in mountain creeks or at the beach to divert the water and shape its flow. In hindsight, one could say these were my early attempts at combining water science and engineering. These also were the early signs of an interest in patterns, patterns the flowing water produced, or the patterns left behind by flowing water, and how they may be related. Years later at university, I learned that some of these patterns could indeed be predicted from first principles, which was a major revelation to me, and hence my fascination with understanding and predicting patterns of water. It was a confluence of circumstances that brought me into hydrology proper – my interest in water and in patterns, together with the role of Dieter Gutknecht as my teacher and mentor. Dieter taught hydrology as an extremely exciting subject at the crossroads of science and engineering and sharpened my desire to explore patterns, and ask deeper questions. My research path that followed over the years has revolved around several collaborations and, in each case, I had the opportunity to learn new aspects of patterns and processes, and new ways to learn from them: measuring and understanding spatial soil moisture patterns together with Rodger Grayson and Andrew Western; understanding regional scale flood patterns together with Ralf Merz and Marco Borga; snow cover patterns with Duro Parajka and Robert Kirnbauer; stochastic patterns of extremes with Alberto Viglione, Bruno Merz and Jan Szolgay; and patterns of scale and co-evolution with Siva Sivapalan, Hubert Savenije and Alberto Montanari, just to give a few examples. And there were generations of my doctoral students where the early apprenticeship most often turned into partnership and, finally, shared learning. In the Vienna Doctoral Programme on Water Resource Systems, which I’ve had the privilege to chair for the past few years, there was still more for me to be learned by way of patterns and processes, as the programme ventured from hydrology to the wider domain of water science that included chemical, biological and socio-economic processes. One of the goals of scientific research is to bring order to what otherwise looks like disorder, to identify connections where none existed, and in this way generate new ideas and novel approaches to advance the science. Hence my abiding interest in linking patterns and processes, as pointed out by Gordon. The idea of bringing theory and practice together and my interest in learning from patterns turned out to be a natural fit to the Predictions in UngaugedBasins (or PUB) initiative so brilliantly masterminded by the IAHS. While the technical aspects of improved hydrological predictions in ungauged basins are extremely important, perhaps, the more lasting effect of the PUB initiative may be its contribution to overcoming the fragmentation in hydrology, by knitting a network of collaborations across different disciplines, across different parts of the world and between individuals and research groups of various sizes. Paraphrasing the title of the PUB synthesis book, these could be deemed collaborations across processes, places and scales. As set out in the recommendations of the book, ultimately we need a better communication culture in hydrology that allows us to better learn from each other, and to better accumulate knowledge. The next IAHS Decade on ‘Panta Rhei - Change in Hydrology and Society’ will be a fantastic opportunity for a new generation of hydrologists to set out and do cutting edge science that is of societal relevance, and move the science of hydrology further forward: something that may entail a lot of hard work but at the same time will be exciting and gratifying. I view the recognition I am receiving today not just as a personal achievement but as a tribute to those closest to me who have supported me over the years through their generosity of spirit. Many of the flattering statements about my achievements mentioned in Gordon’s award citation are the direct outcome of what I have learned from several of my collaborations. I have been extremely fortunate to have had fantastic mentors, colleagues and students – many of whom I am privileged to count as friends today. Space prevents me from naming all of them, but I will be amiss if I do not mention three special people, Siva Sivapalan, Hubert Savenije and Alberto Montanari, for their enduring friendship and support. Special thanks to Berit Arheimer for leading my nomination for this award. Last, but not the least, I would especially like to thank my wife Elisabeth, for being the bedrock of love and support over the past many years. She has been a continuous source of inspiration for me and I love her dearly. I also thank my wonderful children: Roman, Agnes and Margit, my parents and my extended family, who have over the years supported and guided me in my endeavours. In closing, I want to thank IAHS, WMO and UNESCO for honouring me with this award, and I thank you all for being here tonight for me.